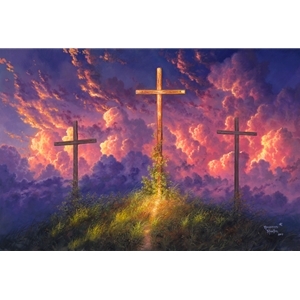 I hope this painting blesses you and fills your heart with love and gratitude for our savior. I hope the path of light in the painting guides you to kneel at the cross with me and look up to the place where he died for us. Let us marvel together with hearts of praise at the risen Savior’s power, majesty, and glory in the heavens. When I purchased this painting it sang to me. Since then it reminds me how blessed I' am. Many people have seen this painting and commented on how beautiful it is but when I invite them to sit before it and examine further and tell what they see it comes more to life thru their testimonies of praise for our Saviour Jesus Christ. Thank you Abraham Hunter for allowing my family to become a blessing to others and using your God given talents to be a blessing yourself.